This double panel, representing St James the Great and St John the Evangelist is probably from a set of twelve apostles which once formed an altarpiece. The haloed figure of St. James the Great stands on the left side of the double panel. He has a forked beard. He wears a gown, a cloak draped over his shoulders, and a hat with an upturned brim ornamented with a scallop shell. He is barefooted. He holds a pilgrim's staff pressed against his body with his left arm; the index finger of his extended left hand points to a scroll. In his right hand he holds a scroll, which reaches from the level of his hat almost to his feet. On it the words from the Apostles' Creed traditionally attributed to him have been lightly carved: 'Qui conceptus est' (Who was conceived). The haloed and beardless figure of St. John the Evangelist, his hair arranged in locks on his forehead, stands on the right of the panel, looking down to his right. He is barefooted. He wears a gown with a cloak over his shoulders, and holds in his left hand a scroll which bears the traces of a lightly carved inscription, doubtless the words from the Apostles' Creed traditionally associated with him. He holds a chalice containing a dragon in his right hand. The right foot of St. James is damaged. The initials I.A. have been scratched on the chest of St. John. The top of the panel is chipped. There is green paint with traces of the characteristic daisy pattern at the bottom of the panel. There is blue on the folds of the cloak of St. James and red on the folds of the cloak of St. John. There is gilding on the chalice, on the hair of both saints, on St. James' beard and on the edges of their garments. The dragon is green with reddish-brown wings. The halo behind St. John is green; that behind St. James is brown. The back of the panel is marked VIII. There are three lead-plugged holes. The bottom is cut away. There is a ridge from top to bottom indicating where two saw cuts have met. Label; On the back of the panel. Said to have passed from a convent nier Liège to a private collection. In the possession of Dr W.L. Hildburgh and on loan from him since 1920. Given by Dr Hildburgh in 1946. Historical significance: Other double apostle panels in English alabaster include one of St. Jude and St. James the Less in the museum of Oscott College, near Birmingham (which appears to be from the same altarpiece as the present one); and a pair of double panels, one of St. Matthew (?) and St. James the Less and the other of St. Simon and St. Jude (? ), in the Art Gallery of South Australia, Adelaide. Alabaster panel depicting St James the Great and St John the Evangelist. English, 15th century. Hildburgh, W.L. 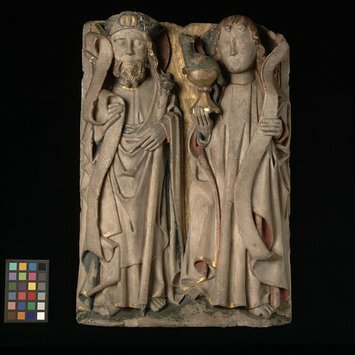 Notes on some English Alabaster Carvings. Antiquaries Journal. I, 1921, pp. 227-8, fig. 4, p. 230. Victoria and Albert Museum. English Medieval Art (exhibition catalogue), 1930, no. 699.